When you have been using and reviewing USB Flash Drives since 2002 when they were 8MB in capacity it is pretty hard to get excited by them. The market is flooded with them as online retailers like Newegg currently list 6,192 products in their USB Flash Drive category alone. It has become tough to find standout products in a category this crowded, but enthusiasts are addicted to performance and we are always on the lookout for new USB Flash Drives that raise the bar when it comes to read and write speeds. Last week SanDisk Corporation announced the SanDisk Extreme PRO USB 3.0 flash drive and we just had to get one into our labs for some testing. Why? SanDisk says this jump drive is capable of sequential write speeds of up to 240MB/s and sequential read speeds of up to 260MB/s! Those speeds place this drive among the fastest available right now. 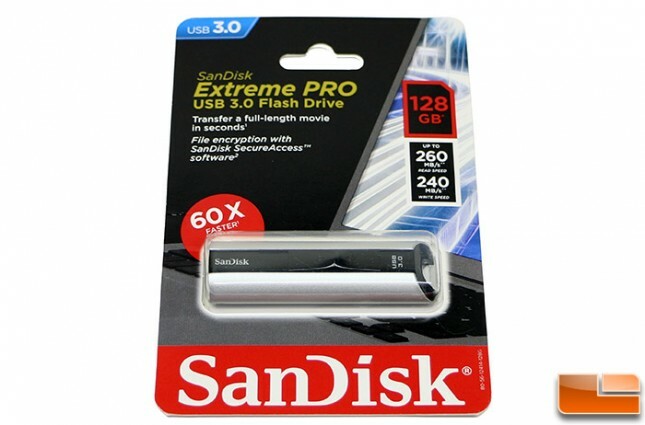 The SanDisk Extreme Pro USB 3.0 Flash Drive is only available as a 128GB capacity drive with part number SDCZ88-128G-A46 in North America and SDCZ88-128G-G46 over in Europe, Asia and Latin America. The SanDisk Extreme PRO 128GB USB 3.0 Flash Drive has a $199.99 MSRP, but it is already available on Amazon for $150.00 shipped. That breaks down to $1.17 per GB for those that like to look at the cost per GB. There are around 50-60 different 128GB USB 3.0 Flash drives currently on the market today and they range from $65 to $180. This means that you are going to be paying more than the average rate in exchange for the higher performance this drive offers. This drive is all about speed though and SanDisk touts that you can can transfer a full-length movie to the SanDisk Extreme PRO USB 3.0 Flash Drive in mere seconds, or 1,000 photos in less than 35 seconds. 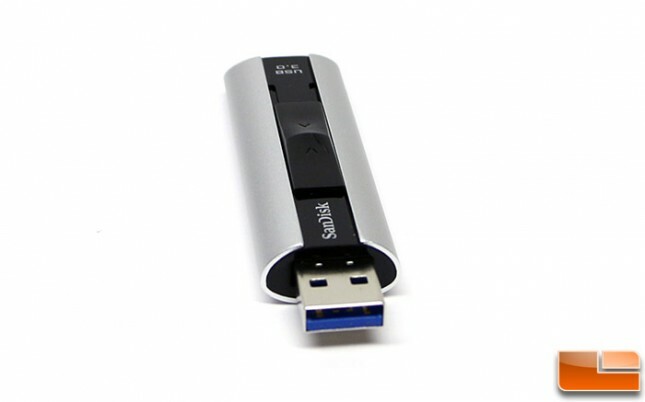 The SanDisk Extreme Pro USB 3.0 Flash Drive features an aluminum metal casing with a cap-less design. To use this Flash driver there is a slide out USB 3.0 connector that is easy to operate with your thumb and keeps you from loosing caps. You might get the occasional pocket lint or some dirt stuck in the open USB 3.0 connector at times, but usually you just clean it out and go about your business. There is a location to attach a keychain or lanyard on the other end of the drive. SanDisk does not include a keychain loop or anything. To give you an idea of this drives size we have included a picture of the Sandisk Extreme Pro 128GB Flash Drive next to a standard Energizer AA battery. The exact dimensions are 11.0 x 21.0 x 71.0 mm; 0.45 x 0.84 x 2.79, which isn’t bad for such a high-end drive of this capacity. Often the speedy drivers are rather chunky due to the controller or NAND used or space needed to keep them cool. This drive does get warm when you move a large amount of data, but nothing that caused alarm or was out of the ordinary. Here is a closer look at the USB 3.0 connector and this is where the magic happens. SanDisk says that this particular drive with its 260MB/s read and 240MB/s write speeds is 60 times faster than standard USB 2.0 drives. This drive is backwards compatible with USB 2.0 drivers and is supportedby by Windows XP, Windows Vista, Windows 7, Windows 8, Windows 8.1 and Mac OS X v10.5+ (software download required for use on Macs). The SanDisk Extreme Pro USB 3.0 Flash Drive has a pretty odd shape that is hard to describe. It almost has some egg shape qualities, but there is a flat bottom that allows it sit still and not wobble after you sit it on desk or any flat surface. Also included is SanDisk SecureAccess software that provides 128-bit AES file encryption and password protection to secure private files while leaving the rest of the drive visible for sharing. 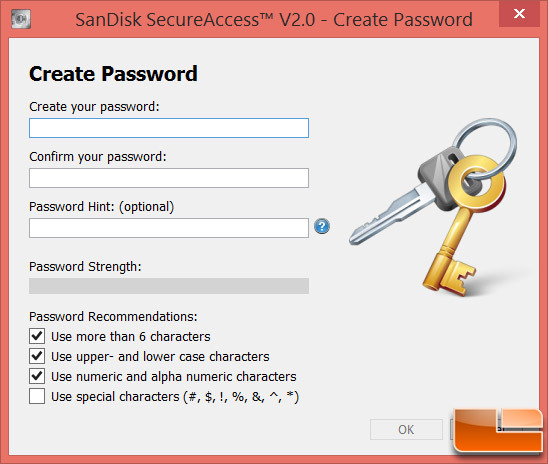 The SecureAccess software comes on the SanDisk Extreme Pro USB 3.0 Flash Drive and looks for online updates the first time you go to install the encryption application. After any updates are downloaded you just need to create a password and then move the files you want to encrypt on the USB Flash Drive to your newly created vault for safe keeping. It is nice to easily encrypt your personal or client information as USB Flash Drives are often lost and the average person isn’t going to go about trying to crack the encryption you placed on the drive. They’ll likely just format the drive and keep it for themselves due to the hassle. 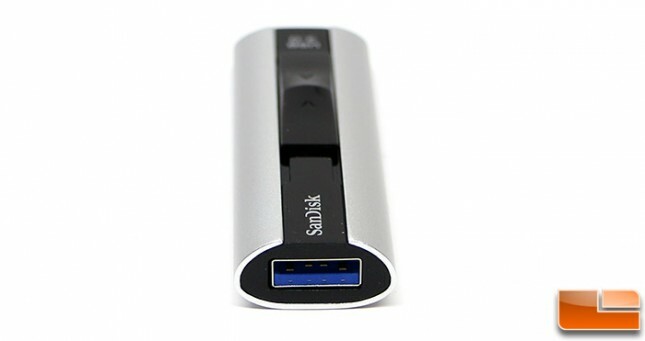 Let’s take a look at the performance of the SanDisk Extreme Pro 128GB USB 3.0 Flash Drive on our ASUS UX31A Ultrabook.